(Click for full size image.) Fujio Gō and Ōsaki Teizō, translation by Timothy Boyle. “Beyond the Death Line: The Society of Love and Cooperation Envisioned by Toyohiko Kagawa.” Kagawa Memorial Center, Kobe, Japan (2015). I had never heard of Toyohiko Kagawa before. (I am still fairly new to the Burke; actually, I was a student at Union Theological Seminary after earning my MLS, and I know the Burke’s circulating collection and research databases very well, but I still have a lot to learn about its Archives and Special Collections holdings.) It turns out that Kagawa’s papers are held in the Missionary Research Library, held at the Burke. He visited the United States many times, and his papers eventually came to be collected at the Kagawa National Center, headquartered nearby in Brooklyn — UTS professor Harry Emerson Fosdick was on the sponsoring committee. 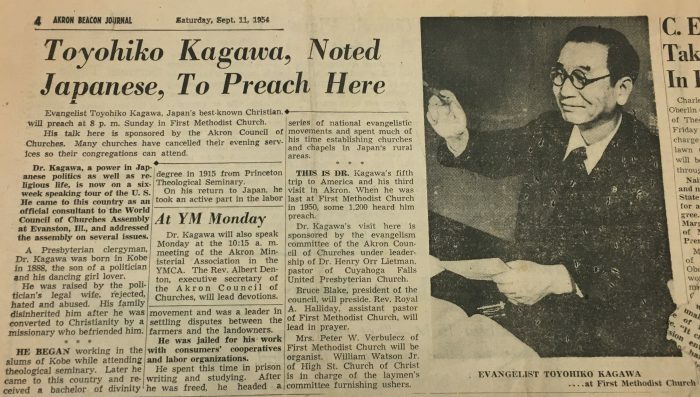 Toyohiko Kagawa was a pretty impressive person, and an inspiring subject for seminarians to study. Toyohiko (given name) Kagawa (family name), born in 1888, was a theologian, activist, labor reformer, and pastoral caregiver, who worked in service of improving the lives of farmers and workers in Japan and internationally throughout his life. (He struggled with health complications and died in 1960, having been nominated once for the Nobel Peace Prize in 1955.) What strikes me most about his life and work is the incredible range of activities his leadership touched in Japan — from building medical hospitals in the “slums” of Kobe to founding cooperative farms to organizing labor unions, he accomplished a great deal towards empowering farmers and laborers. He spent a brief time in prison after being arrested following a labor demonstration. As well as being a gifted writer and theologian, he was a shrewd economic thinker and researcher — for example, he studied horticulture while forming his cooperative farms, and from reading about farming practices in Greece he got the idea of planting chestnut trees in the grazing areas of pigs in mountain farms, so that the roots would prevent rock slides while the trees provided food for the animals. Not to mention his prolific scholarly and literary life. He is said to have missed a lot of class while he was a student because he spent so much of his time in the library. (You can see why I find his personality so endearing.) He became a prolific writer, and his constructive activities were funded in large part thanks to sales from his books and speaking engagements. Having studied at Kobe Theological School, he eventually made several trips to the United States, including to earn an MA and MDiv at Princeton. 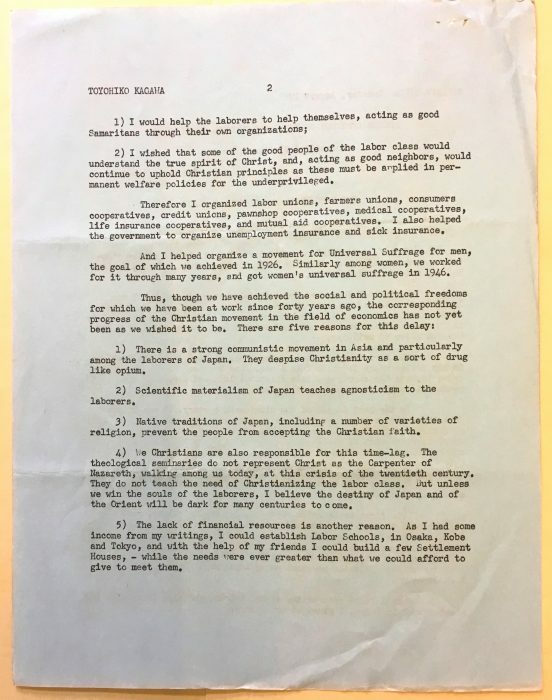 Later in his life he made several speaking and churchgoing tours of the U.S., including in 1954, which are well documented by correspondence, newspaper clippings, and other materials in the Toyohiko Kagawa Papers. 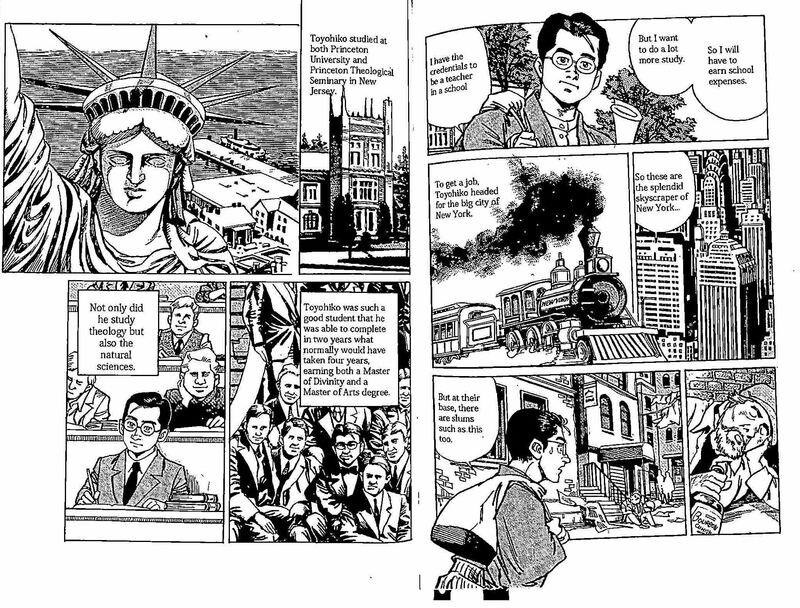 I learned a lot about Kagawa by studying the materials we have here in the Burke Library, and from reading this biographical graphic novel that our surprise visitor gave me after her visit. It is called Beyond the Death Line: The Society of Love and Cooperation Envisioned by Toyohiko Kagawa. The Kagawa Memorial Center produces and distributes these books, drawn by Fujio Gō and written by Ōsaki Teizō, and I cannot find another copy in any library catalogs in the United States. She gave it to me personally, but perhaps I will donate it to the Burke Library’s collections so others can continue to study Kagawa like I did. 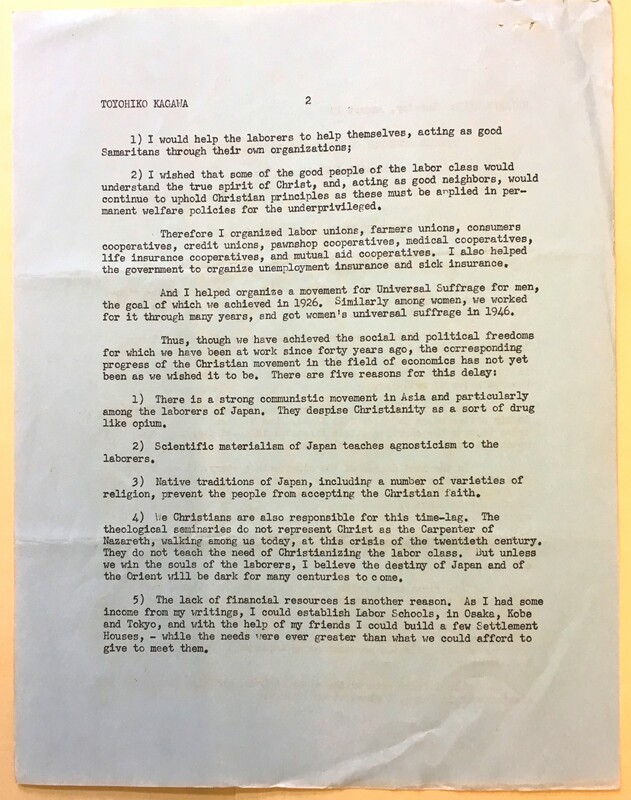 This entry was posted in Archives, Collections, History, Union Theological Seminary History and tagged activism, Archives, Japan, Kobe, labor-unions, Missionary Research Library, theologians, Toyohiko-Kagawa on April 13, 2018 by Carolyn Bratnober. I’m currently a Master Degree student in the Sophia University, Tokyo and I’m also doing my research on Toyohiko Kagawa. However, I’m focusing on one of his works, his autobiographical novel Shi-sen o koete (Across the Death-line), which was published in America in 1924 under the title Before the Dawn. I’m also planning to go and visit the archive sometime this year, and I’m very encouraged and pleasantly suprised to know someone from Kobe has come and visited. Looking forward to meeting and seeing the archive soon! Thank you for sharing this information, Carolyn and Kristine. I am writing my doctoral dissertation on Kagawa’s philosophical theology/cosmology at Kyoto University. My master’s thesis is about Kagawa’s view of evil (moral philosophy). I am happy to learn of growing interest in this remarkable man. Dear Carolyn, What a joy to see that you have been bitten by the Kagawa bug! Before coming to New Haven, I received a three -year grant from the John Templeton Foundation, and as part of that grant I wrote a monograph of the sources of Kagawa’s views on science and religion/spirituality, entitled Seeing All Things Whole: The Scientific Mysticism and Art of Kagawa Toyohiko (1888–1960), Pickwick, 2015, edited Jim Heisig’s translation of Kagawa’s last book, Cosmic Purpose, Cascade, 2014, and translated some meditations of Kagawa as A Few Words in the Dark, Bridges to Peace, 2015. Though I have steered many people to Burke, I would love to see the Kagawa collection firsthand sometime soon. I am currently the executive director at the Overseas Ministries Study Center, editor of the International Bulletin of Mission Research, and lecturer at Yale Divinity School.